After nearly a year of intense collaboration, KNCV will soon be releasing the new PMDT toolkit for the introduction of new drugs and regimens. To support the introduction of new drugs and shorter treatment regimens the toolkit contains a different complimentary elements; a programmatic and clinical guide, an electronic implementation plan and Standard Operating Procedures for the programmatic and clinical management of the process. Furthermore the toolkit contains guidance on requirements for QTc measurement in ECG monitoring for the treatment of MDR-TB patients, a checklist for nurses monitoring SR and IR patients and guidelines for the use of audiometry in the treatment of DR-TB patients. 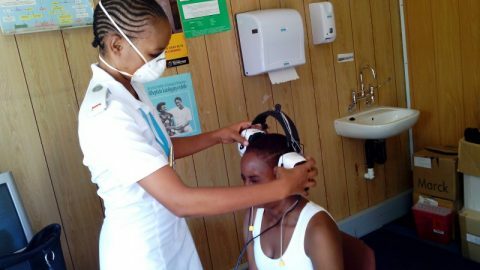 Working from the KNCV led Challenge-TB program’s recommendations, the new guidelines on audiometry can help reduce deafness as a potential side-effect of DR-TB treatment, improving the chance of treatment adherence and alleviating much potential suffering.